Whether you're setting up an apartment, settling into a starter home or downsizing into a condo, space is probably at a premium. With a Murphy Bed, you can get the most out of your space by having a room do double duty—as a home office, workout or crafting room during the day and as a bedroom at night. Our hardware kits are available in twin, full or queen sizes and include top-quality mechanisms that make opening and closing the bed easy. Some of the latest kits even include a metal mattress frame with curved wooden slats for extra comfort. The included instructions walk you through the building process step by step, and you can customize your Murphy Bed cabinet enclosure to fit your style. 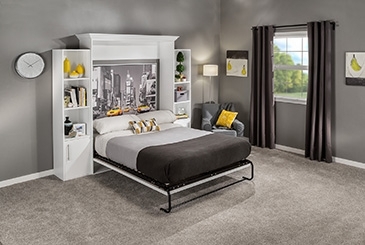 What you end up with is a space-saving hidden bed that you'll be proud to show off.